Apple’s latest OS X version, Yosemite, is ready for download, but simply installing the system is only the first step in a very interesting journey. Apple has made significant changes across OS X, improving the Safari browser, Notifications Center, Spotlight searching, and even how the desktop finds synergy with iOS devices. It’s a potentially daunting collection of tweaks and additions, but we’re here to make your Yosemite education as painless as possible. Please join the Macworld staff as we walk you through our Yosemite primers—and if you don’t find the article you want, please make some suggestions in the comments below. If you’re already happily running Mavericks (Mac OS X 10.9) on your machine, you’re good for a Yosemite upgrade. But if you want more information on which specific Macs are compatible, check out this guide. Hint: Apple confirmed that you’ll need at least 2GB of RAM and 8GB of free storage for the installation. Yes, even in this day and age, there are still best practices for installing a new Apple OS. Our “How to install Mac OS X Yosemite” primer will walk you through everything from simple nerd wisdom (like updating apps and cautionary back-ups) to different strategies for installation itself. 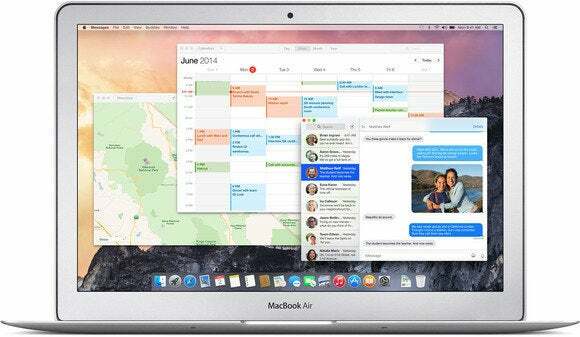 Yosemite has been built from the ground up to support Retina displays like the one deployed on the new iMac. As such, the new OS is chock-full of new visual optimizations, including a new font, translucency effects, and interface tweaks that advance the OS X design language. We explain everything in this brief of what you’ll encounter in the Yosemite design. At its Thursday event, Apple touted new Continuity features that foster graceful synergy between our desktop and mobile experiences. Key to the scheme is Handoff, a feature that lets you launch an app on one device (say, your Mac), and then “hand off” that activity to another device (your iPhone or iPad). It’s enabled in Mail, Messages, Maps and a host of other apps, and you can read all about how it works here. Spotlight started as a relatively simple system search tool. Today, in Yosemite, it’s a full-fledged Internet crawler that can not only rifle through your OS, but also the web, Wikipedia, news headlines, maps, Bing, the App Store, iTunes, and even movie show times. We discuss all the new Spotlight features here. OK, they don’t pack the same levels of glitz and glamour as the tweaks listed above, but changes to Mail, Messages, and Calendar will certainly influence your Yosemite experience. You can read about new features like Mail Drop, Markup, and Soundbites here.